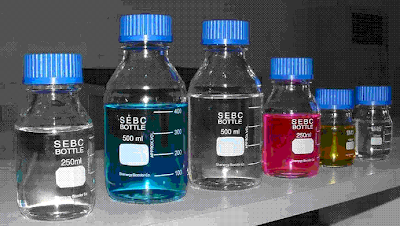 Determination of the shelf life of solutions including volumetric solutions, reagents and buffer solutions in laboratory. Incorrect strength or concentration of volumetric solutions, reagents and buffer solutions can alter the results of analyzed products. Solutions prepared for chemical analysis are not stable for a longer period. The molarities of these solutions may change after a period of time. The shelf life of solutions depends on the nature of the compound and the solvent also. Therefore, it is necessary to validate the stability period of these solutions individually in which these have to consume. Validation of shelf life is a mandatory GLP and regulatory requirement. There are different ways to assign the shelf life of solutions; following are the simplest methods for the same. Prepare the volumetric solution and allow standing. After 24 hours determine the molarity of the solution in triplicate calculating the mean of the results and continue the determination at an interval of 3 days for 15 days. Determine the RSD of all 5 values. If RSD of all 5 values remains less than 1.0, the shelf life of solutions should be assigned 15 days otherwise RSD shall be calculated with first 4 values and shelf life should be assigned 12 days. If the RSD of first 4 values remains more than 1.0, RSD shall be calculated with first three values and shelf life of solutions should be assigned accordingly. Reagents solutions, those are used in analysis as reactants and molarity are not calculated. These are validated on their performance. The Performance of these solutions is checked at an interval of 7 days for 1 month. Evaluate the performance of all 4 tests and assign the life accordingly. Buffers are generally used for calibration of pH meters. pH of buffer solutions may change due to chemical degradation. The shelf life of buffer solutions must not be assigned more than 7 days. Note: Solution should be stored under proper storage conditions otherwise results may alter giving improper shelf life. Validation data should be recorded and maintained for regulatory audits. Could you tell me a reference to the guideline which describes the self life of volumetric solution? I am looking for a formal guideline. Ok, but there I could not find volumetric solutions method. Where can I read RSD less than 1.0? Ph.Eur. gives RSD less than 0.2. Could pl provide the Indian Cosmetics manufactures Guidelines. How do you determine shelf life of buffer solutions prepared for HPLC analysis? Check buffers for any haziness, precipitation and their pH. By above we can decide how much day our solution valid. But for standardisation what should I do?